OK, so let’s see if my experiment will work. Based on my previous lack of success in predicting the seasons*, declaring winter should mean we see lots of sun! This is the view from University Gardens on Thursday. The concrete building in the background is the Boyd Orr Building, home of lots of lecture theatres and that sort of thing. * A similar thing has happened with both football-related posts I have posted on this blog. I banged on about “good luck Scotland” and they lost both matches. Next time they play I’ll wish the opposition good luck, and Scotland will probably thrash them. I’m so embarrassed – only 2 days ago on this very blog I confidently declared “Spring is on the way!” And the very next day (i.e. 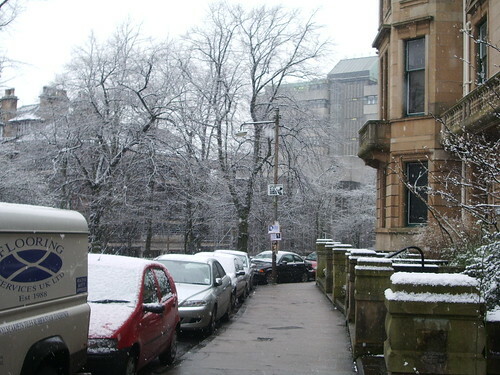 yesterday) this is what Glasgow woke up to! This is at the university, in front of the main building. Actually all the snow had pretty much gone by lunchtime, I wonder what we’ll wake up to tomorrow? 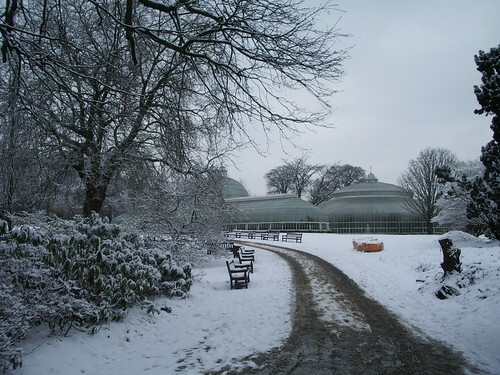 Staying in the Botanic Gardens, here’s the Kibble Palace glasshouse looking lovely in the snow. I’m going to stick with the snow for a couple more days as it’s much more photogenic than the weather we’ve had the last few days! This is from the Botanic Gardens (I think I showed a similar view when it was frosty a month or two ago). I really like this one enlarged (click on it, then once you’re in flickr go to All Sizes and pick Original). Even though you can see the slushy path. I’m away for the weekend so won’t be able to respond to comments or visit elsewhere for a few days. Have a nice weekend! 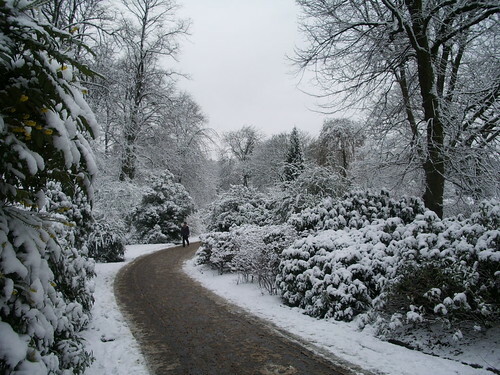 The snow in the Botanic Gardens really looked beautiful. It’s all disappeared from the trees now (though lots of grassy areas still have some snow). I’m glad I managed to capture the tree snow before it all went. On Monday we woke up to find that it had indeed snowed. Not so much that everything ground to a halt, but still enough to last a couple of days. An enterprising group of student protesters found a novel way to make their point here. 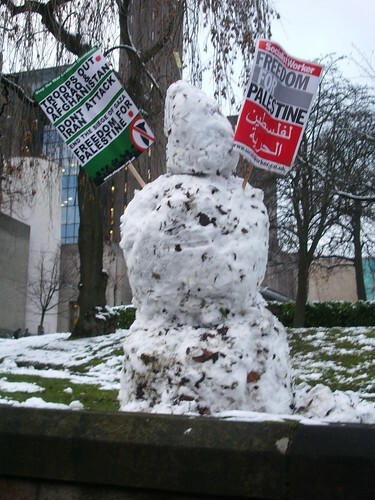 By yesterday it had melted, but attention was away from here anyway and instead on the Computer Science Building, which was occupied by students protesting about the Israeli action and occupation in Gaza. 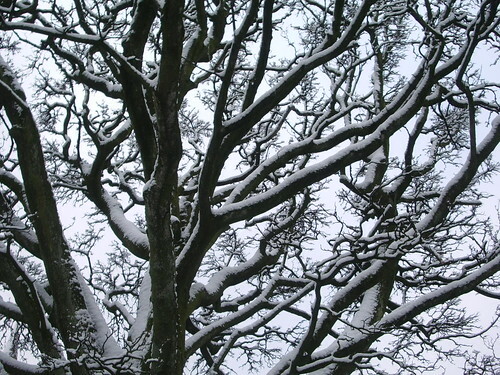 There have been loads of snowy pictures from the UK daily photo blogs this week. 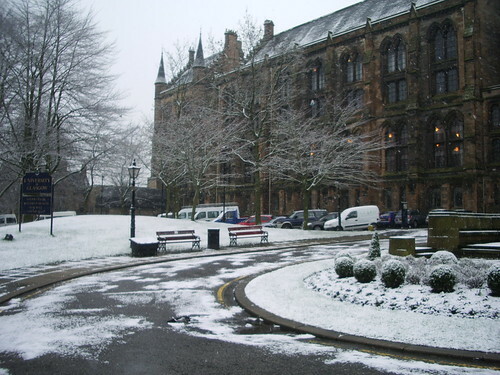 Here in Glasgow we had snow on Monday, but it had all gone by Tuesday. 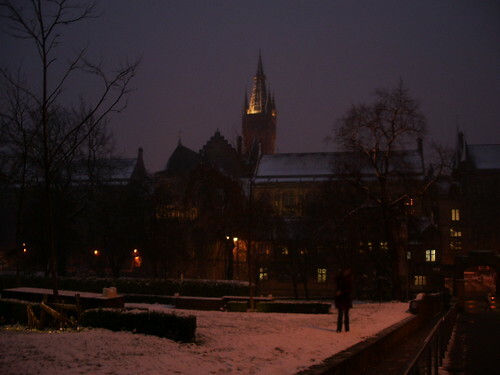 This is a picture I took on Monday evening (sorry about the underexposure) on my way to the bus stop, of the university with a light coating of snow. It snowed again yesterday afternoon, but not that heavily. I wonder if it’ll still be there in the morning. On Monday I looked out of the office window and saw big big snowflakes falling. 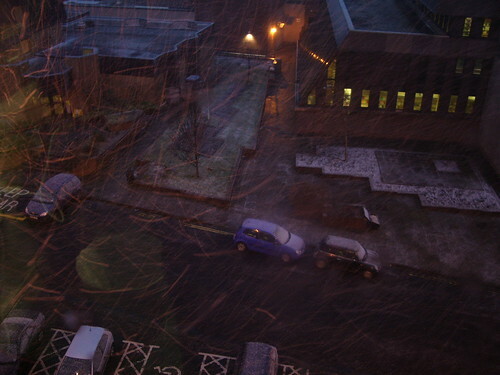 I had a go at taking some pictures – I had wanted to capture the sense of the big white flakes, but as my window isn’t one you can hang out of and the flash would have just bounced off the glass, I tried it without flash and got this very bizarre effect. The snow settled, but was gone the next morning.